Lobby signs serve a variety of purposes. 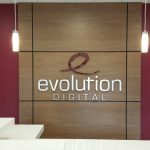 Effective custom lobby signs let visitors know that they’re in the right place, and at the same time, work hard to enhance the professional appearance of your business. From a sign behind the reception desk to indoor directional signs, the right customized lobby signs that include your company name, font, colors, and logo can help build your brand awareness and your credibility. When your business looks professional, customers and visitors will find it easier to trust your products and services. If you’re considering creating custom lobby signs for your Denver business, Magnify Signs can help. Our experience and knowledge mean that you’ll get the signs you need that best represent your brand and your business goals. To help make every lobby sign unique, there are many different options in terms of graphics, fonts, and colors. Additionally, it’s not just the type of sign you use, but where you place it, and what materials you use that help make the sign a memorable marketing tool. If you want to upgrade your lobby space so that you’re really putting your best foot forward, here are some custom lobby signs and placement options to consider. 3D Letters – Three-dimensional letters make it easier to stand out. They look professional but can also have a strike of upbeat energy, depending on the font and graphics choices used. These letters are easy to make in different colors, making the options near limitless for customization. Acrylic Signs – These lightweight signs are easily customizable and also remain vibrant and professional looking for a long period of time. Vinyl Graphics – Small or large graphics can be added to punch up any lobby sign. Panel Signs – These signs are the traditional choice when it comes to lobbying signs. They can be made out of a long list of materials including acrylic, foam, and metal. Panel signs can be shaped into nearly any form. Metal Letters / Metal Laminate Letters – These signs are available in brushed aluminum, bronze, or painted colors. They enhance the professional and stylish appearance of your business. Once you’ve chosen the right type of sign for your lobby, it’s time to decide on the right placement. Donor wall signage can be a feature in your reception area, but wouldn’t be placed in the same spot as your main lobby sign. To make the most of your lobby space, make sure you have great signage in the following areas. The most appropriate location for a custom lobby sign really depends on the layout and size of the room, and where your visitor’s eyes are most likely to gravitate when they enter the space. For most buildings, this location will be opposite the door or along a side wall near the entrance. Reception area lobby signs add to a cohesive appearance for your business. Many businesses have multiple people that a visitor may need to see, and by placing informative indoor directional signs in the reception area you’ll be improving your customer’s experience. Custom lobby signs that are branded, clear and accurate will reinforce that your company is professional, connected and organized. Other reception area sign options include listing the names of employees and their location or listing service options. Waiting rooms are a great place to install custom lobby signs. Those left waiting are usually looking around, so why not take advantage of the opportunity to reinforce your brand? Having strong brand representation in a waiting room can actually be reassuring to new visitors. For a more effective approach, include some information about your company, about the products and services you offer or add a unique feature like donor wall signage to capture their interest. For smaller businesses that may not have a lobby or reception area, you can still reap the benefits that a lobby sign can offer by installing a custom lobby sign in the hallway outside your office. Even without a formal entry area, you’ll still be able to inform visitors where you’re located and raise your brand awareness at the same time. Because there may be building regulations regarding hallway signage, be sure to check with your building about allowable sizes, materials, and mounting options. Professional signage companies like Magnify Signs can create and install custom lobby signs that adhere to all regulations reinforced by both property managers and municipalities. For high-quality signage that promotes your business and raises brand awareness, contact Magnify Signs. We can create custom interior and exterior signage for businesses in all industries and are dedicated to providing you with signs that help you ‘Be Seen’ and match your brand aesthetic.